The adjustable foot that supports the pilasters is made from stainless steel (Grade-316) and its base is anchored to the floor with nylon plugs, inserted into ground with stainless steel screws. Stainless steel channels are attached with the divider panel to the wall as well as the mid panel. There is a ground clearance of 150mm. Stainless steel top rail with panel tube holder is used to fix the pilasters at the top with the arrangement of tabular holder and wall bracket. 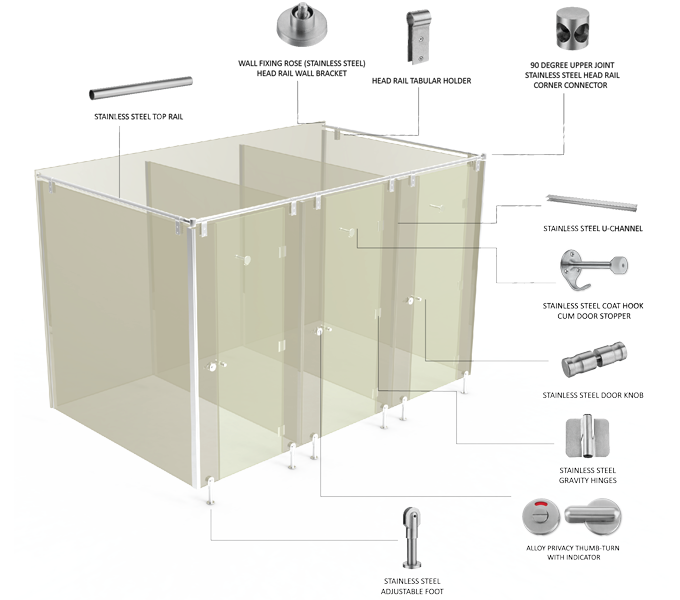 Stainless steel corner connectors are provided for imparting extra support to the restroom cubicle of L-shaped system. Further doors are incorporated with the noise deafening tape to reduce the noise effect.